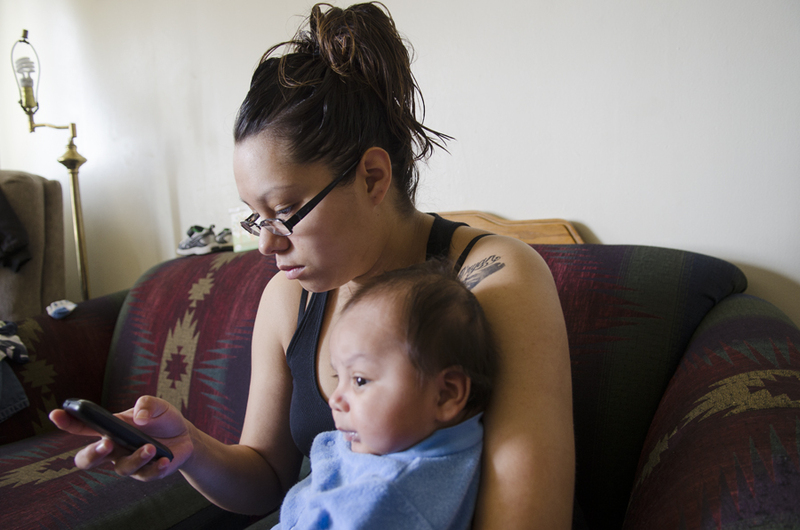 Brittany Deavila, 19, holds her 2-month-old baby O’Ryan in her Wolf Point apartment. Deavila is waiting to buy a high chair she found on the Facebook group, Fort Peck Rez Online Yard Sale, for $40. The chair is too big for O’Ryan now, but Deavila says he will soon grow into it. 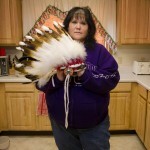 Amy Headdress DeHerrera stands with a headdress she made for her youngest son. 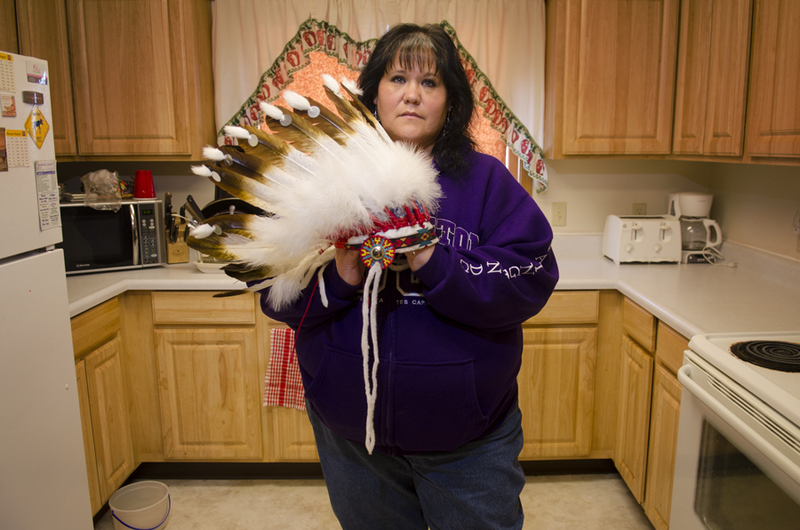 The headdress was stolen over a year ago, but DeHerrera recently recovered it when someone tried selling it on the Fort Peck Rez Online Yard Sale Facebook group. She founded the group several years ago as an online arena for people to buy, sell and trade goods and services. Azarian Bear, 12, of Wolf Point tries on shoes at Bryan’s, the only large clothing store on the Fort Peck Reservation. Employees say their biggest sellers are shoes and children’s toys. Otherwise, the store’s relatively high prices discourage many people on the reservation from shopping there. 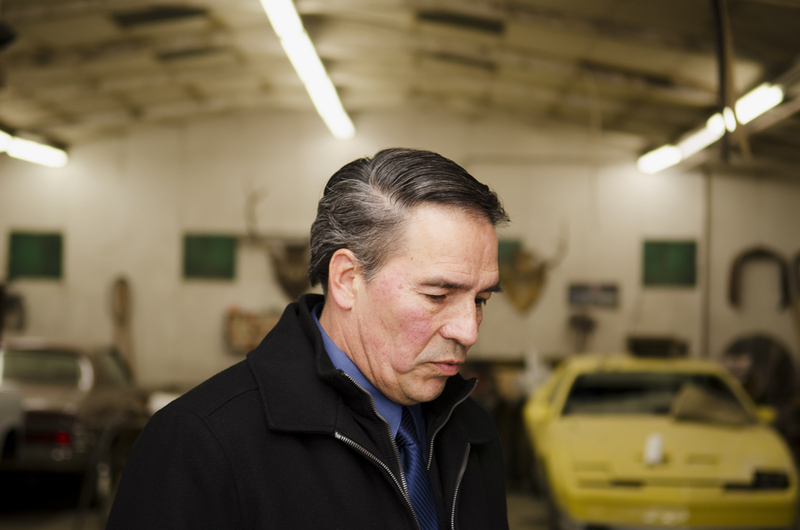 Fort Peck Tribal Chairman Floyd Azure used to operate a body shop in Poplar where he charged $60 an hour for work. The building now stores his personal automotive projects until his term as chairman is over. He says although he could easily start his business up again, many people on the reservation are unable to pay the prices of certified shops, such as his. Lenny Gray Wolf, left, and Brad Gray Wolf inspect the engine compartment of a Ford Windstar. Lenny and Brad, along with their brother Tote, have been working on cars since their childhood. 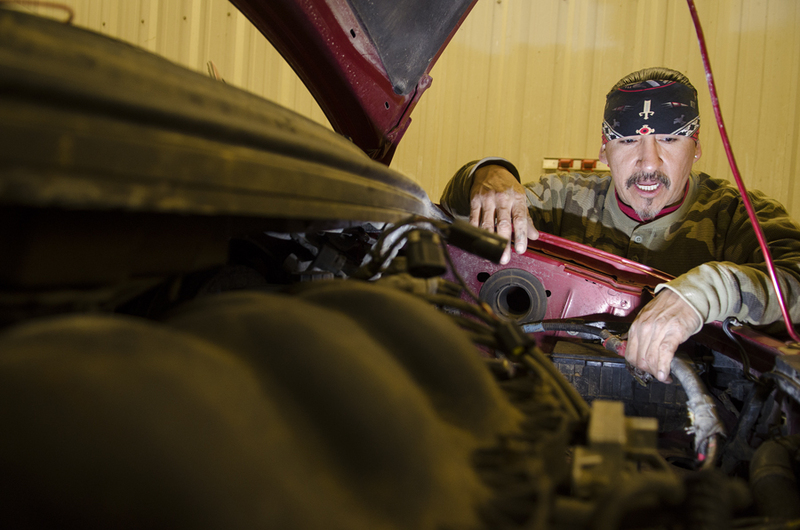 This skill now provides them with extra income and fills a niche in the community for inexpensive car work. Tote Gray Wolf shows off his “mechanic hands.” Gray Wolf is a certified mechanic with Fort Peck Transportation but works on several projects on the side for friends and family unable to afford the cost of getting their cars serviced at a certified shop. 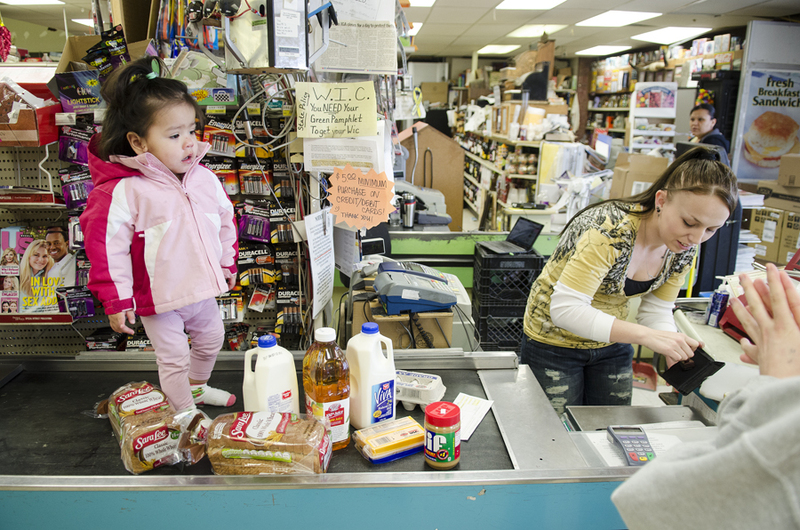 Kaydence Brown stands on the conveyor belt at Tande Grocery in Poplar while cashier Charley Swanson rings up the family’s purchases. A woman walks through the town of Brockton. 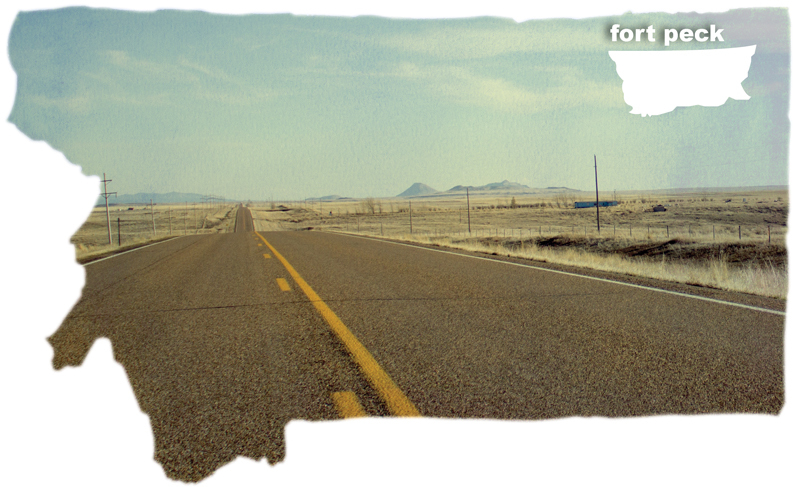 The remoteness of the reservation means many services and goods that are readily available for people in larger population areas cannot not be easily found. Courtney Gunter, left, Julie Acheson and Angie Soper stand with Ophelia, an 1,800-pound quarter horse Acheson is trading to Soper for reclaimed lumber and $1,500. 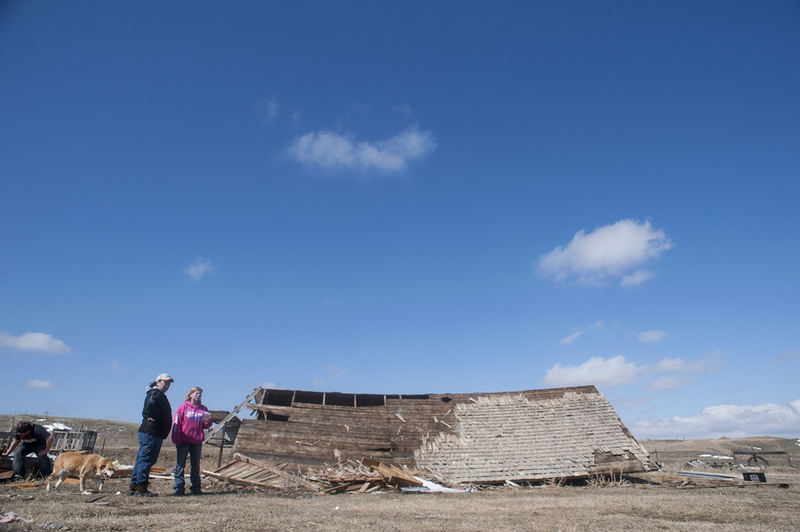 Julie Acheson and Angie Soper stand next to a fallen barn on Soper’s property in Glasgow, which is just outside the Fort Peck reservation. Acheson traded her 1,800-pound quarter horse, Ophelia, for the salvaged lumber and $1,500. O’Ryan wakes up, but his mother doesn’t mind. He hardly makes a fuss as sun breaks the blinds of their Wolf Point apartment. Brittany Deavila is waiting in her sweats. She has an hour before heading to one of her two jobs. She stares absently at the TV while the 2-month-old bounces on her knee. Finally, a pickup truck growls outside, the noise rousing her cat, Oreo. It’s here. Brittany stands up to check, waiting without expression, and sees Autumn Arthur walking across the stubbly yard from her silver Chevy. Inside, Arthur sets down the delivery, O’Ryan’s new high chair. “It’s 80 to 100 dollars at Wal-Mart,” Deavila says, which is nearly 100 miles from here. Instead it’s here at her front door after traveling 24 miles from Poplar. Arthur sets down the high chair, a colorful contraption complete with kid-friendly animals, and shows its new owner how to adjust the height. She then stands a little impatiently before Deavila disappears into a bedroom, returns with $40, including $10 for delivery, and Arthur is gone as quickly as she appeared. The chair is Deavila’s latest success at online window-shopping. She arranged the delivery on the Facebook group, Fort Peck Rez Online Yard Sale. 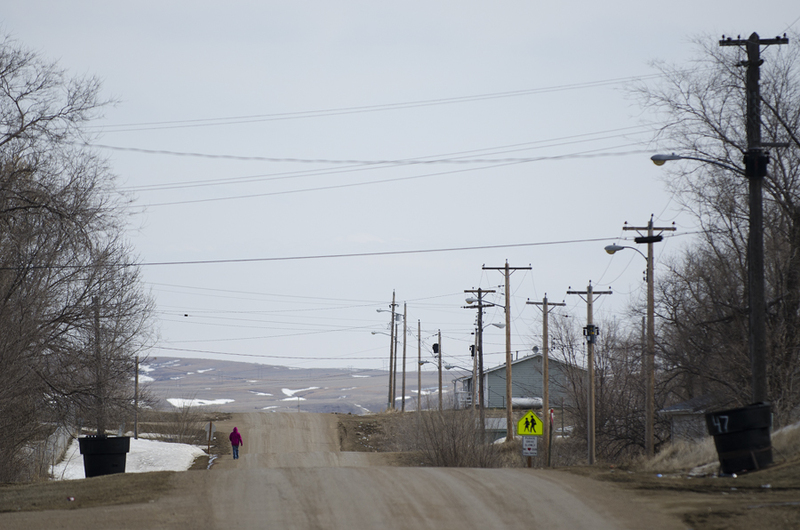 Though the Internet helps fill the gaps, there’s no shortage of goods and services on the reservation, or in Wolf Point at least. But with rising rent, $50 pairs of jeans, $6 gallons of milk, the nearest Walmart in Williston, N.D., and gas at $3.60 a gallon, the Fort Peck economy incentivizes many to find a better deal on Montana’s most isolated Indian reservation. The Fort Peck Indian Reservation lies in the northeast corner of the state close to the Missouri river. Nearly the size of Connecticut, it’s home to around 10,000 people; just over half of them are tribal members. Being ultra-rural is only half of it. The 2011 per capita income in Roosevelt County, the largest swath of the Fort Peck reservation, was $17,433, compared to $24,640 in the rest of Montana. For Sioux and Assiniboine tribal citizens, housing is scarce, and it doesn’t just come for free. There are polar ends of livelihood here: those without a job who qualify for housing assistance, and those who make enough to afford rising rent or the rates on high interest loans. Those in the middle often get left out, making too much money to qualify for aid or too little to thrive. Which means that alternatives to the regular storefront economy, such as bartering, trading and secondhand purchasing, are just a way of life up here. People spend money, time and resources on each other. There’s no other way to bridge the distances. High-speed Internet and 3G service have been a huge boon to life on the reservation since becoming available in the past few years. It connects the major population centers—Frazer, Wolf Point, Poplar, Brockton—in ways that Highway 2 cannot. It also gave birth to the Online Yard Sale. Now boasting over 1,800 members, it’s a way for people to get a hold of necessities without having to travel or order online. By volume and frequency, with population taken into account, it’s more active than Craigslist forums in Billings or Missoula. On May 3, a few of the top listings included makeup, girls’ jeans, a digital camera and an ’87 F-150 for $350. Rarely will there be a post older than a few days — someone’s always looking for what’s being offered. Amy Headdress DeHerrera created the Facebook group, something akin to Craigslist only reservation-specific, in September 2011. She turns down the chattering police scanner (everyone here has one, she says) in her well-kept house in Poplar’s Airport Addition, a tribal housing development. Truly, one room downstairs is nearly filled with furniture they acquired solely through the site. There’s a leather chair, a leather jacket and a futon. Even their oldest son, Santigo, bought his white Ford Explorer through the group. The emphasis on helping young families and children keeps her motivated in curating the site. “Someone once was in need of baby formula, and within a few hours they found it,” DeHerrera says. Mike Turcotte and his wife use the group to get clothes and diapers for their kids as well as their own clothes.Turcotte taught seven classes at the Fort Peck Community College over spring semester. He is young but professional and speaks with earnestness during his Intro to Native American Studies class lecture. While Poplar is in what many would consider a beautiful part of the country, the town itself appears less so. A visitor’s first impression will likely be the trash. Because it’s everywhere; in the streets, in yards and piling up on an embankment overlooking the old A+S Industries warehouse. 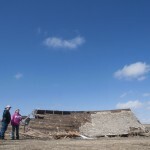 A quarter-mile removed from that scene sits the pristine tribal headquarters, the seat of government for the Sioux and Assiniboine tribes of the Fort Peck reservation. Down a gray hallway sits the Economic and Energy Development Office. Policy analyst Tashina Tibbits taps away at her cell phone while the wind blows across an empty amber field out the window behind her. That much in food stamps doesn’t get very far on the reservation. 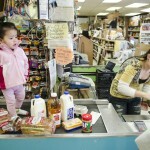 In the center of Poplar, surrounded by shuttered bars and storefronts, are the town’s two grocery stores, Main Street Grocery and Tande Grocery. Main is small and well-lit, but not exactly an oasis of choice. Cheap ($3.75) bacon is sold out, and many people are spending time in the frozen foods aisle. Around the corner at Tande’s, the cheap bacon is also nearly sold out. A woman offers warmed pizza rolls to those entering as little Kaydence Brown stands on the only cashier conveyer belt alongside a stock of milk and bread. The produce is limited to shelf-life friendly items like carrots and onions, though the avocados don’t look too dark. “We had 10 gas stations, a bowling alley, four or five restaurants, five or six grocery stores, four car dealerships all with a smaller population in the ’60s and ’70s,” says Floyd Azure, the elected chairman of the Tribal Executive Board. He says though population has slowly grown, businesses have quickly disappeared. Cheaper prices at big box stores off the reservation have driven money out of the local economy. Azure says the majority of money spent by tribal members is spent off the reservation. The attitude reflects the idea that there is a void on the reservation; that drugs, alcohol and poverty are winning. At least there’s no shortage of roads. Day and night the diesel engines roar up and down the main drag in Wolf Point, and the bumpy roads off the highway are specked with more cars and trucks than homes. Lenny Gray Wolf inspects the engine compartment of a Ford Windstar. Gray Wolf has been working on cars since his childhood, a skill that now provides him with extra income and fills a niche in the community for inexpensive car work. 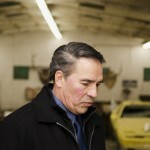 The brothers Gray Hawk have benefited from that culture, having spent their lives inside of vehicles. Lenny’s leaning on his sister’s red Ford Windstar while Tote gets the hydraulic jack ready at the garages of Fort Peck Transportation, where he works as a bus driver and mechanic. “I just want to put some gas in and get it to go,” Lenny says. The 52-year-old is wearing a thick camouflage shirt. He has a black bandana tied across his forehead holding his sunglasses up and his hair back tight. His humor is as dirty as the fluid they release from the antifreeze tank. They’re working on reconnecting everything under the hood of the minivan after successfully installing a transmisison. After they free the engine block from “the octopus” of chains that had been used to hoist it out of the vehicle, Tote and Lenny jack up the front end a few feet. Lenny gets on his back first as the third mechanic brother, Brad, 54, walks into the garage. 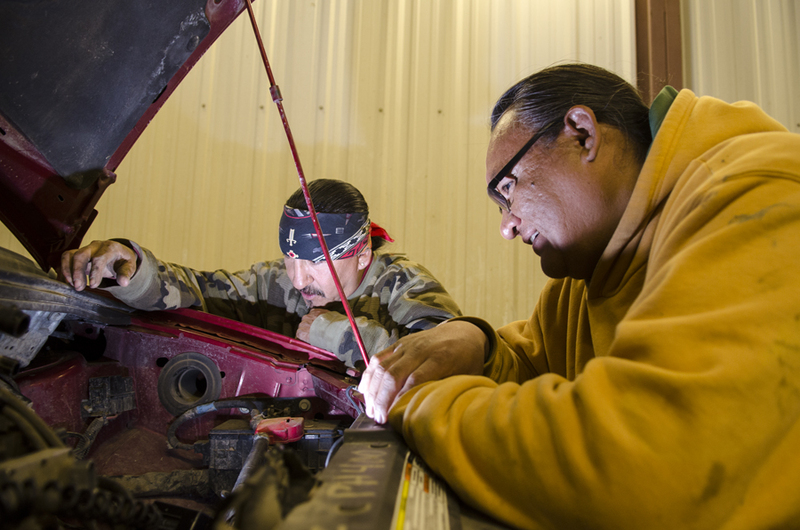 Everyone on the reservation seems to know a car mechanic, and not the ones who work at the dealerships in Wolf Point. “A loaf of bread is $4 a loaf, dude. People have more important things to spend their money on than putting $1,200 into a car,” Lenny says. “But everyone wants to drive around. Everyone wants to get from point A to point B.” So word gets out fast of who can get a car back on the road for half the price the dealers charge. He points out that the hundreds of vehicles in the “car graveyard” in a field between Poplar and Wolf Point probably only need a few hundred dollars of work. The red minivan above him sat there for two years. Lenny gets out from under the steering column and points to his biceps. “Native American torque wrench,” he says, laughing. Brad once worked in a Cenex garage in Poplar, and Tote is also certified, though Lenny held out on the education and certification. Most of what they know came from their mechanic father and practice. The stockier brother, Lenny, just finished a day shift working as an electrician at the under-construction tribal detention center, but seems genuinely thrilled to keep on working into the night. He says many people in Fort Peck help family and friends that otherwise can’t (or shouldn’t) afford car repairs. Even Chairman Azure ran a garage in Poplar for 30 years. He could open it back up any day, he says while checking on his yellow T-bird and impeccably restored Mercury. Just this year he’s helped out two of his co-workers at the tribal offices with maintenance for lower rates than what they can find at other garages, which charge around $70 an hour plus the cost of parts. Too expensive for most, he says. People often don’t wait until the next paycheck. 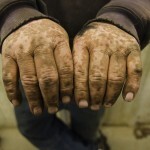 They make ends meet trading car work, clothes, diapers or horses. On a sunny Monday afternoon, Julie Acheson drives with her daughter along the “Indian Highway,” which runs parallel to Highway 2 north of the train tracks. “It’s warming up today,” her daughter Jocelyn says, pointing to the car’s overhead thermostat reading 38 degrees. 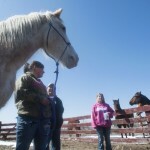 They’re on their way to some land north of Glasgow, just outside the western border of the reservation, to drop off Ophelia, an 1,800-pound quarter horse. They decided against the main route, since anything above 35 mph might scare her and send the whole Dodge Durango and trailer off the road. Ophelia is being traded for $1,500 and the lumber salvaged from a felled barn. 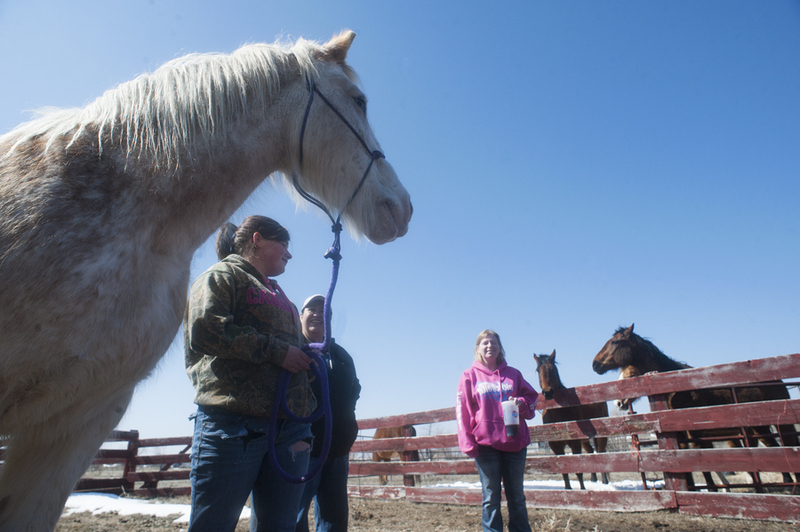 Back at her home on the edge of Wolf Point, her family keeps a dozen horses, a 34-year-old mule and a few cashmere goats. She wants to use the reclaimed lumber to build a new home on her property to replace the aging trailer. Acheson explains on the 120-mile round trip that she is always looking for good trades both on and off the reservation. Her daughter Jocelyn recently traded a car stereo for amps for her own car and often trades between her friends. 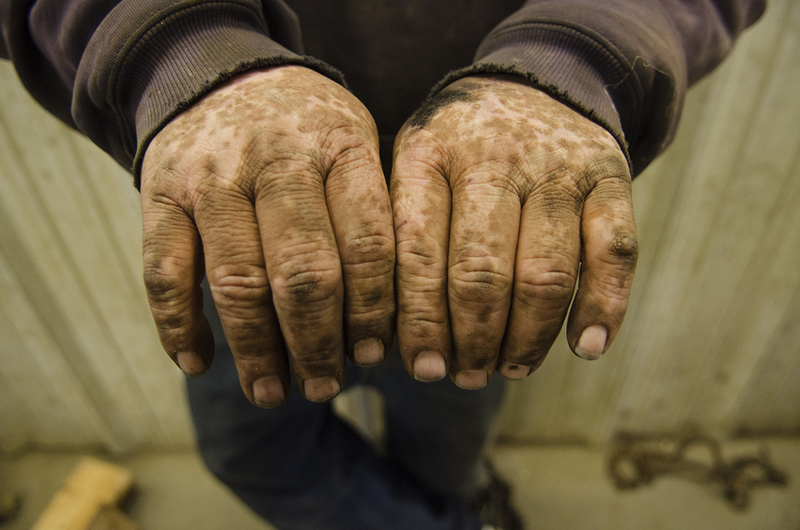 “I think people used to barter a long time ago before grocery stores,” Acheson says. “I’d like to see it come back. A lot of traditions have been lost due to outside influence. I think it’s important to teach kids about trading and morality.” Acheson uses the Online Yard Sale for her barters, too, making trading a visible presence among its active members. They buy groceries at Wolf Point’s Albertsons, just like the many people who can afford to in town. Occasionally they’ll buy clothes at Bryan’s, the only retail clothing store on the reservation, but often find it too expensive for what they offer. They stop at the new ALCO (think Shopko) occasionally instead of making the trip to Glasgow or Williston for the few big-box items it carries. Few hold out hope for lower prices, increased choices and stable rent on the Fort Peck reservation. It’s too rural, too economically depressed, they say. There’s a reason Acheson trades, though. There’s a reason the Gray Hawk brothers share their mechanical strengths, and Brittany Deavila and other young mothers have an advantage that comes with a new means of connectivity. Every necessity of life gets met, though the means may be a bit different.